TheatreWorks is organizing a 6-day interactive playwriting workshop at 72-13 from 29 May – 4 June 2017! 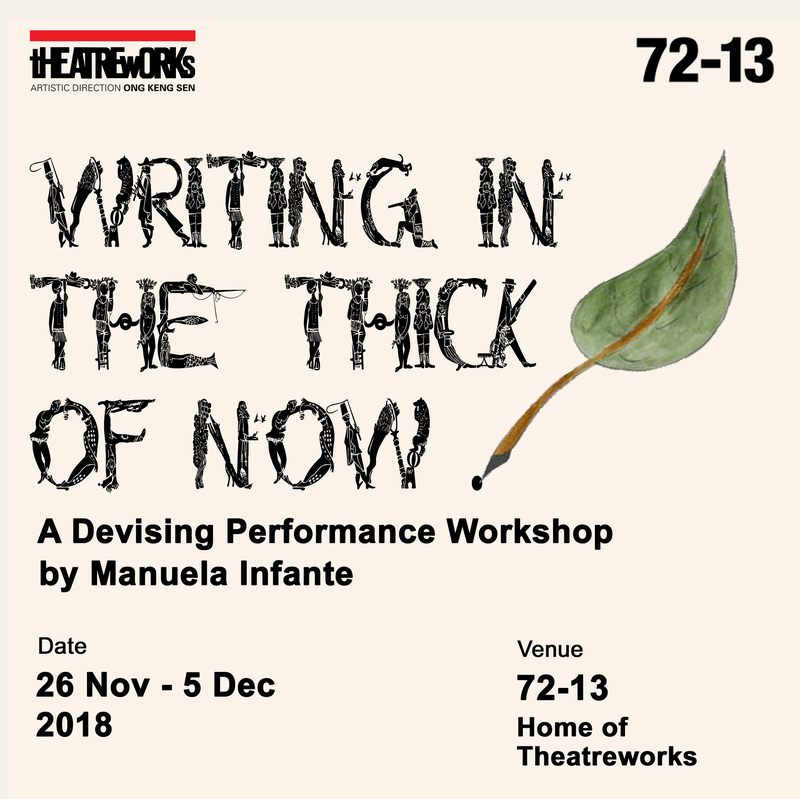 Conducted by Tony Perez, renowned playwright and novelist from the Philippines, these workshops comprises a series of interactive hands-on exercises designed to enable participants to discover their inner self and creativity in exploring the basics of playwriting. After the successful edition of Writing from the Heart in 2014 – 2016, Writing & Community once again invites him to conduct an interactive playwriting workshop this May 2017. Writing from the Heart has previously discovered over 40 new writers and gave them the basics in playwriting. Through a series of hands-on exercises, which include drawing, dialogue and interpersonal interaction between participants, the mentor and within themselves, these exercises drew out the writers’ potential from within and these discoveries became important material and inspiration for playwriting. Emerging Singaporean playwright Helmi Yusof, first penned his new play My Mother Buys Condoms at the workshop in 2014. It was then further developed over a period of one year through a series of dramaturgical clinics under the guidance of Perez, before being presented to the public at a dramatized reading in July 2015. Since then, it had been picked up by local theatre company, W!ld Rice, and staged professionally as a full production at the Singapore Theatre Festival in July 2016. Helmi is one of the success stories that TheatreWorks is proud to have nurtured and supported through its Writing & Community programme. “Tony’s teaching approach makes people feel empowered. I’ve never met a teacher like him. The workshops were honest, emotional and visceral, it exceeded all my expectation”. – Jason Montes, participant of Writing from the Heart 2016. “Tony Perez is a wonderful, thoroughly unconventional and intuitive teacher. He talks about everything from chakra points and meditation to Freud and Jung, and you’re asked to try them out in class, so you have to have a very, very open mind.” – Helmi Yusof, participant of Writing from the Heart 2015. “Everyday there was a self discovery – from our favourite character in a fairytale to our imbalanced chakras, which we balanced through the use of a pendulum, to the Eros and Thanatos concept which improves the inner voice in writing” – Eliete Vivino, participant of Writing from the Heart 2014. TheatreWorks is now seeking a new group of writers for this workshop. Those interested, please email ezzat@theatreworks.org.sg or call Ezzat at 6737-7213 to register by 25 May, 12pm. Open to participants 17 years and above. Please note, you will be expected to present a short script by the end of the workshop. There will be no sessions on Saturday, 3 June 2017. Tony Perez is a Filipino playwright, novelist, and visual artist with an M.A. degree in Religious Studies, an M.A. candidacy in Clinical Psychology, and an A.B. in Communication. He has authored two major, full-length trilogies of plays in Tagalog, some of which have been translated into English and Polish. His full-length play “Trip to The South” were performed in New York and in Singapore; another full-length play, “On The North Diversion Road,” was performed in Melbourne and in Singapore. After having more than 40 books published in the Philippines, he is devoting the rest of his life to posting his new and forthcoming books in cyberspace. They can be accessed through his main blog site, http://www.tonyperezphilippines.blogspot.com. His artworks have been showcased in more than 15 exhibitions. Perez is also the founder of the Spirit Questors, a group of young, psychic volunteers who render service to the public free of charge. Among his other interests are fiber art, puppetry, the use of drama in psychotherapy. In his home country, he conducts workshops to under-served audiences such as victims of human trafficking and sexual abuse, children in conflict with the law, prison inmates, child combatants, and residents of drug rehabilitation centers. Perez has worked with TheatreWorks since the 1990s. He led in workshops like Writing from the Subconscious (1990), Explore the Physical Psychic Sense for Creative Writing (1992) and wrote Trip to the South performed at the ASEAN Season Festival in 1991.